Welcome to our new “Ingetour – where to stay while boating the Vltava river” section. 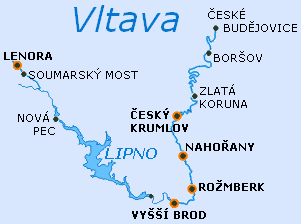 This year we run four camp sites along the upper Vltava [the leg from Vyssi Brod to Cesky Krumlov]. For those who are after better comfort we offer our cosy lodging houses in Rozmberk and Cesky Krumlov. We would like to believe that our complex services [boat rentals – camp sites – hostels – left-luggage offices – transport] will help you have a great time while on the Vltava river. We look forward to seeing you. Please remember to make your reservation in advance if possible. Thank you :-] . See you soon on the river!